Hello my faithful readers! 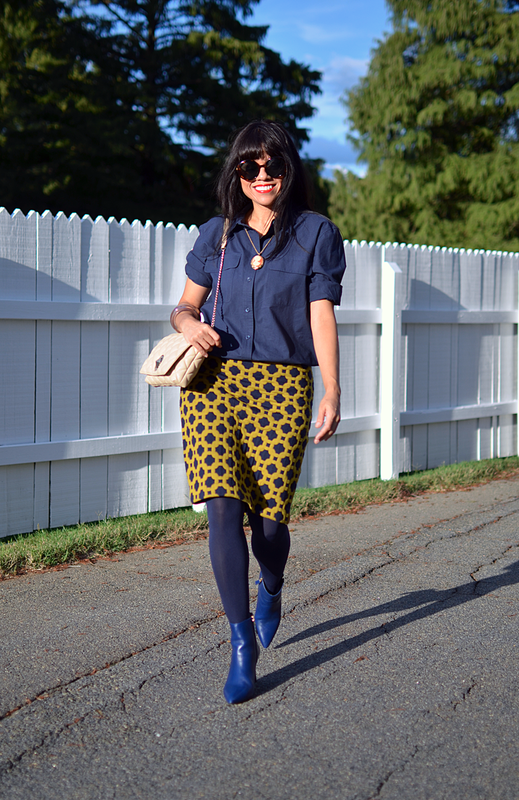 Today I'm showing my modern way to wear a retro print. Let me start saying that I love all shades of green, so the golden green in this skirt is not the exception, however, due to my olive complexion, I prefer to wear certain greens in areas away from face. Anyway, besides liking the colors of this skirt, I also appreciate the 1960s inspired print, which by the way, it looks like is trending again. 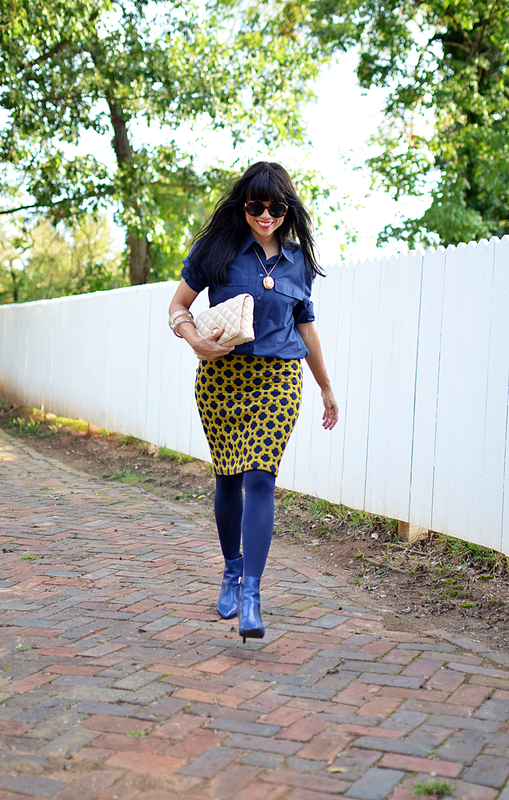 I was very aware that the pattern of this skirt wasn't subtle, therefore, I wore everything else in a solid color. Yes, of course, the color blue seemed to be the right choice for a matchy matchy gal like me and besides, it made this retro print stand out even more. 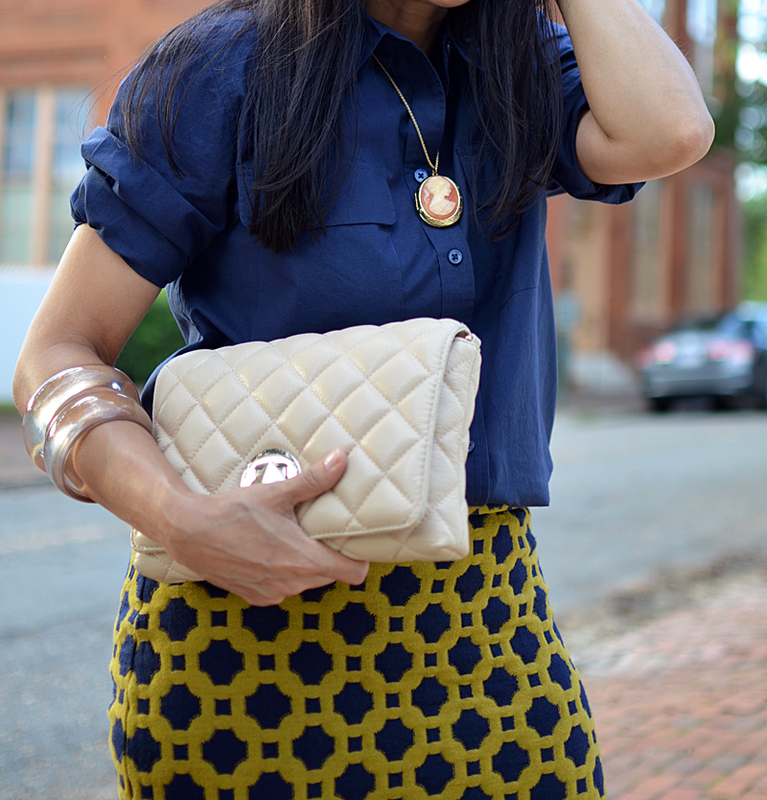 Now, in order to create a balance between the skirt and the rest of the look, I chose to wear neutral colored accessories. Hola mis lectoras fieles! Hoy les estoy demostrando mi forma moderna en que me puse un estampado retro. Me encantan todos los tonos del color verde, por lo tanto el verde dorado de esta falda no es la excepción, sin embargo, debido al color de mi piel, prefiero usarlo en áreas lejos de la cara. Ademas de gustarme los colores de esta falda, también me encanta su estampado retro de los años 60s, el cual se esta poniendo de moda otra vez. El estampado de esta faldita no es sutil, por lo tanto opté en ponerme el resto de mi conjunto en un color sólido, y por supuesto el color azul pareció ser la elección correcta para una chica matchy matchy como yo. Elegí usar accesorios en tonos neutros con el fin de mantener mi look agradable a la vista y con mas balance. 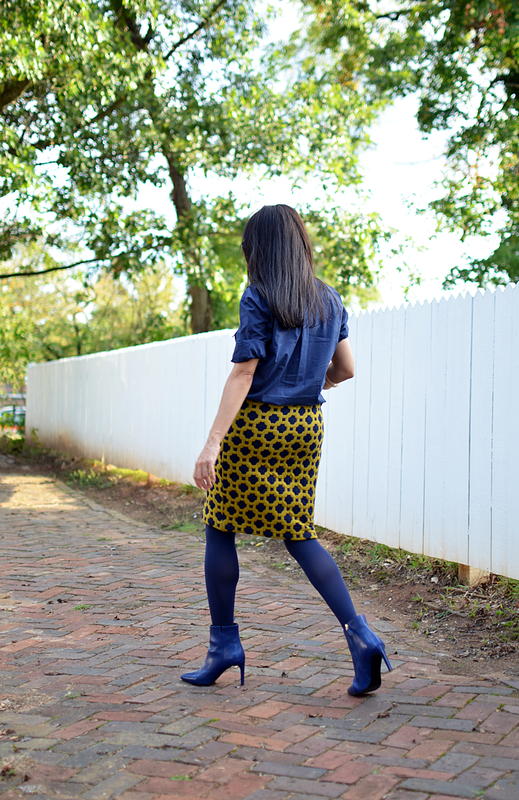 Skirt/Falda: Anthropologie (A few years old). See a fun alternative here. Sunglasses/Gafas: Chanel (vintage). This style is nice. Bag/Bolsa: Kate Spade. Check out this similar version in bone color.